Yup with the new scenery's there might be some aircraft starting position issues. Just might have to adjust/move your airplane a tad. 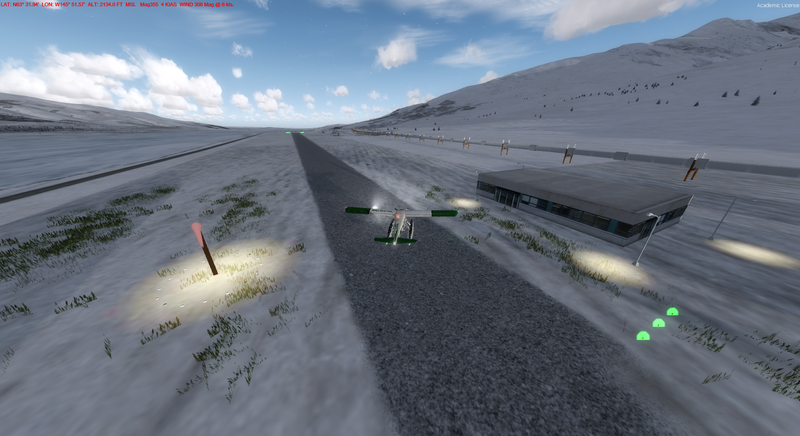 Bes to move your plane first to your desired position at the airport/strip before you actually start the recording of the flight in cigar box if that's possible. Interesting observation? 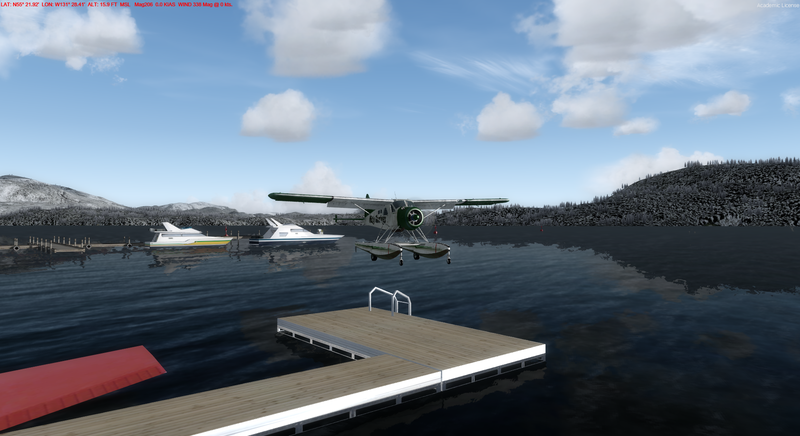 On quite a number of occasions when taxing on water to wet-docks I have hit a "hidden" solid object and suddenly found my aircraft elevated out of the water and with wheels down (and sparks flying!). 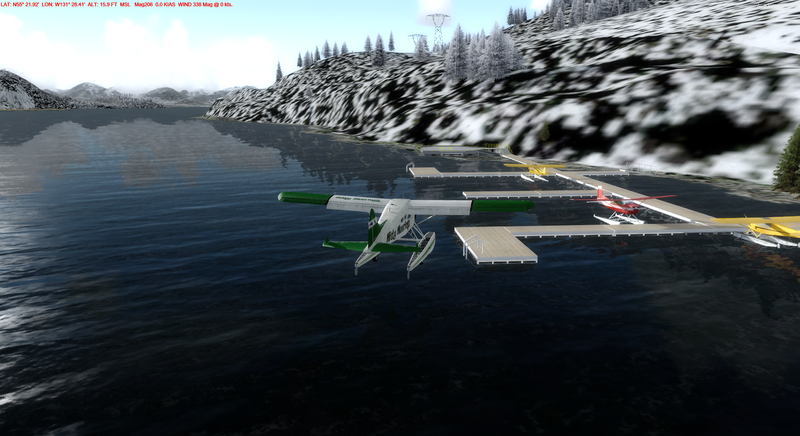 Especially when landing at stop-over seaplane bases, you have no option but to resolve the situation before continuing. I go to slew mode, slide out of the issue area, then come out of slew mode. I run Cigar Box on a network, and while it does log the slew mode, I get no warnings and the flights have always been Approved. Hmmm.. if you can let us know when you get into these subterranean type locations it would be helpful to try to fix or adjust the elevation or at least try to identify what other scenery might be running if any: IE: Global, Vectors, LC, or 3rd party mesh that might contribute to causing elevation variances. I found at some RTMM locations 3rd party mesh and even some default locations has messed up the elevations or terrain, even as you mentioned but when my 3rd party mesh was deactivated (or enabled or disnabled in Vector) the location elevation was ok. One I really noticed was 5BK (Black Rapids) (BWEP) but when mesh was turned off that location was fine. All/most of the RTMM locations are total custom work and now a scenery refresh project going on here so any info on anomalies would be helpful. The issue of suddenly being elevated out of the water, sparks flying and wheels down is an object issue. Let us know where you encounter this, with a screenshot and coordinates, and we should be able to fix it. It almost certainly as to do with the way the offending object was sized when it was placed in the scenery. It doesn't have anything to do with mesh, terrain, or elevation issues. Competing scenery would be a 1 in a million chance as well. I'm 99.99% certain about this. Nina's Landing ... 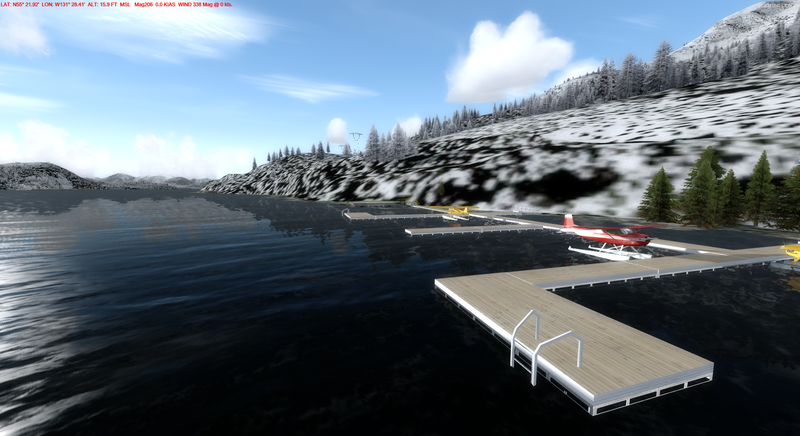 I taxied to the dock, and am sitting above the water and stopped. For the elevation issue at 5BK, use FTX Central's settings page to open Vector and disable airport elevation correction for it. So the mesh stuff kinda of stuff is just elevation stuff - but hitting stuff is object anomaly stuff. I'm seeing more clearly. Ok. Sure glad there are very smart anomaly guys here to get those intrusive object anomalies back in line!!. No Jeff, it isn't actually a matter of the hard surface not being properly sized to the object, but rather the original object itself, in this case the dock, was resized when it was placed in the scenery with IS. So, if the dock had been placed without changing it's size, there would be no problem. As an object designer and scenery developer, I know this from experience. Hardened surfaces are actually treated as separate, and are invisible, attached objects to the underlying object that they rest upon. So when the underlying object is resized, the attached object (hardened surface) doesn't resize along with it. Now when the aircraft hits the invisible, hardened surface (object) it bounces or floats. Finally, any competent object designer who creates an object requiring a hardened surface, would size the hardened surface to sit exactly on the underlying surface. Clear as mud, right? Truthfully, I don't know why a dock would require a hardened surface anyway, unless it was intended for a helicopter to land on it.